Well, I had the place to myself this weekend. My daughter and husband were off camping. That meant simpler meals to serve only one person. Also, it meant a few treats for mommy, since I was not setting an example for anybody! 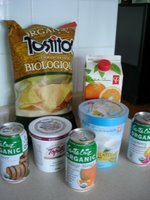 I started with a trip to the Great Canadian Superstore and treated myself to some better pecan toffuti (my absolute favourite), organic sodas, orange/cranberry/raspberry juice, corn chips and lemon gelato. I have a real weakness for ice cream (in case you didn't notice). We tried the raspberrry gelato before and it did not disappoint, so I had to try the lemon. It was delicious too. The organic root beer was absolutely incredible. I loved it. I will definitely pick that up again. On Friday night I made myself a waffle for dinner. Because my daughter wasn't around I was able to throw a small scoop of toffuti right on top and drizzle it with maple syrup. It was defnitely yummy. I had been craving fresh salsa and corn chips since 28 cooks posted it on May 22nd and May 30th. I made my own and it was pretty good. I am definitely going to try the recipes from 28 cooks because I wasn't that impressed with mine (let me know if you have any suggestions for good salsa recipes). What did you put in yours? BTW, thanks for the link!! I put in onion and garlic (blanched with boiling water), tomatoes, lime juice and cilantro. I didn't put in any peppers because our grocery stores never have the kinds they call for in salsa. It probably needed some peppers....it definitely wasn't hot enough. BTW, how did you come up with the name 28 cooks? I love your blog. 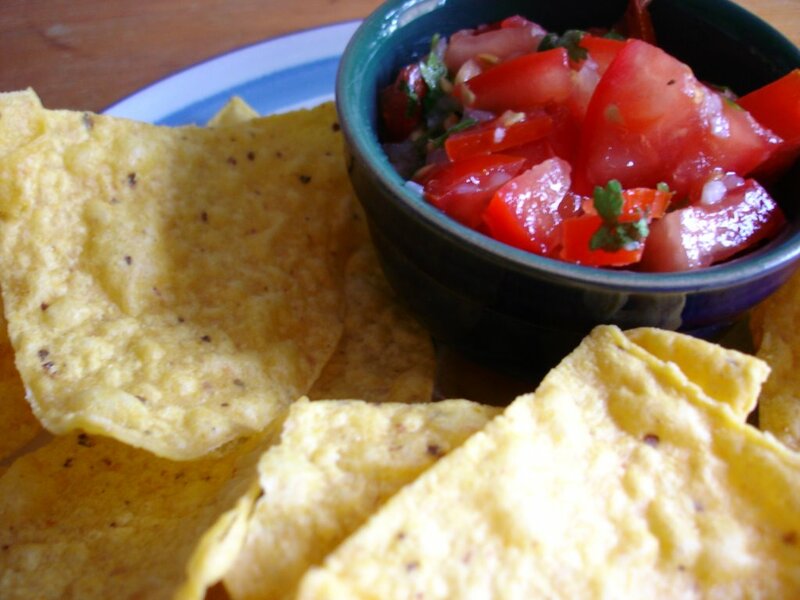 Sounds like you have the perfect ingredients for salsa, but you're right - peppers would have made it better. dragonslayer - better pecan toffuti sounds amazing! I'm going to have to try it. I don't have much experience making salsa, so I can't offer any advise but to listen to whatever 28 cooks says....her food ALWAYS looks amazing. I'm glad to hear you had fun this weekend. 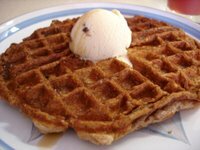 I love how you had a waffle with ice cream without your kid!!! Just kidding, you really have it together for 28! I don't think I had food that figured out then! LOL! Yes, peppers. I need to be more patient at the grocery store... I just wanted to get my toffuti and go home! I should have spent some time looking for some chipotle peppers... some liquid smoke...There are so many ingredients in recipes that I haven't used yet and sometimes I just get a little frustrated trying to find them in the grocery store. I seem to overcome so many obstacles in any given day... but try some new ingredient in a recipe, find a new ingredient in a grocery store??? this is all too much for me to overcome right now! LOL! Megan - toffuti is amazing. I absolutely adore it. I think it is better than hagendaz. I got it at the Great Canadian Superstore /Loblaws - not in the organic aisle, in the regular ice cream isle. Also, I'm thinking my daughter (4) might actually eat home made waffles (who doesn't like home made waffles???) if I put ice cream on them, but wouldn't want to get in the habit. Wow, thanks for the compliment, megan! And dragon - so many have asked me what happens at 29. I think I'll just keep it as 28, so it has a nice sense of nostalgia. And as far as new ingredients, I normally just grab them when I see them, so that they're on hand when I need them. I agree though - sometimes finding the stuff takes forever!